As with last week, the image above is a section of a much larger image (the linked file is about 7.5 MB). 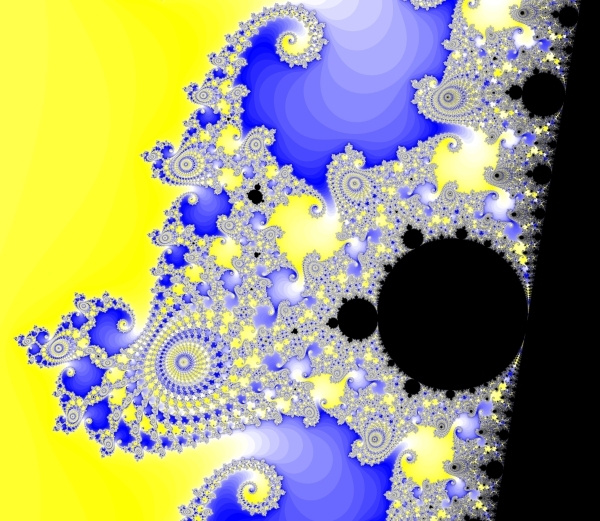 This image shows a small portion of “Seahorse Valley.” Seahorse Valley is a region of the Mandelbrot set which is centered near \(-0.75+0.1i\). At a large scale, this region of the set looks like a large, jagged fjord. When one zooms in, however, more and more details emerge. Spiral formations, which look like the tails of seahorses appear, and multiply along the border of the set. In this particular image, I have attempted to use a blue and yellow color scheme which gives the impression of the ocean breaking on the beach.